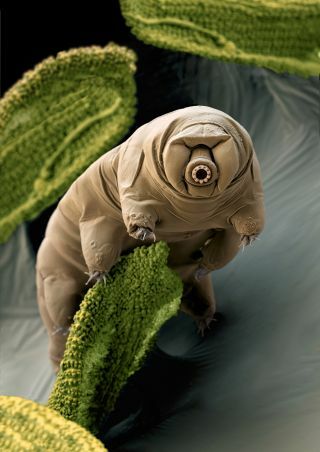 Tardigrades, also known as water bears or moss piglets, can survive being boiled, frozen and sent into space. Studying extreme examples of life on Earth can help scientists looking for life beyond our planet. NEW YORK — Animals that survive in some of the most extreme environments on Earth — places once thought to be totally inhospitable — have made scientists think more broadly about where life could exist elsewhere in the universe. How can these tenacious, Earth-bound creatures help space scientists look for life elsewhere in the universe? A new exhibit at the American Museum of Natural History (AMNH) in New York highlights animals and organisms that demonstrate an extraordinary ability to survive. Some live in temperatures below freezing or above boiling; others can regrow limbs or survive a dose of radiation 1,000 times higher than what a human can withstand. "Extraordinary claims — like life on Mars or life on other planets — should require extraordinary proof," said Siddall, who is also curator of the Department of Invertebrate Zoology at AMNH. "I think at least we're getting a better sense of what the range of that proof might look like, because we've got a better handle on the range of possibilities [on Earth]." The new temporary exhibit at AMNH, titled titled "Life at the Limits," is a good reminder that the word "habitable" is relative. Environments on Earth that would kill a human being have become home to strange organisms and animals. Take the African lungfish, which lives in shallow pools of water that often dry out. The fish can survive for years without food or water by burrowing into the mud and wrapping itself in a mucus cocoon. There are tubeworms living at the bottom of the ocean that survive in superheated water filled with acids, metals and sulfur. The African lungfish (Protopterus dolloi) can survive for months to years without food or water by burrowing into the mud and wrapping itself in a mucus cocoon. Extreme examples of life on Earth could help scientists look for life beyond our planet. The expanding list of organisms living in extreme environments on Earth seems to support the idea that life could survive on other planets. "It gives us a sense of the possibilities, but there are limits," Siddall said at a press event for the new exhibit. Through the discovery of some highly resilient life-forms, scientists have found that all life on Earth requires liquid water (making it particularly important when liquid water is found on planets or moons beyond Earth). "We know some things can survive [being frozen solid], but they're not living while they're doing it," Siddall said. "They're in a form of suspended animation. They're not in the process of living and respiring and getting nutrition and moving about. They're chillin', if you will." The tardigrade — one of the most resilient life-forms on Earth — is an example of an animal that can enter a state of hibernation in order to survive through difficult times. Also known as water bears or moss piglets, these pudgy-looking, eight-legged creatures are about 0.04 inches (1 millimeter) long. The new exhibit at AMNH includes 10-foot (3 meters) models of tardigrades. AMNH is a multidiscipline institute, and Siddall said he's able to discuss the limits of life with colleagues from many different fields, including astrophysics, astrobiology, geology, anthropology and more. He says there are two key points he wants to convey to astrobiologists searching for life elsewhere: look for diversity, and don't overinterpret results. Studying extreme life-forms on Earth has shown evolutionary biologists that the weird and wonderful diversity of species on Earth arises in large part due to changes in the environment, Siddall said. In very static environments (like places deep in the open water of the ocean, away from sunlight and food sources), microorganisms don't accumulate very many mutations, and the species doesn't tend to evolve. The lesson for exobiologists is that more advanced life-forms are more likely to arise in environments that experience change. "You want to look at a dynamic planet, as opposed to a very static planet," Siddall said. Mars has undergone significant changes in its lifetime — the desert landscape that exists today may have once contained oceans and rivers of liquid water. The black swallower lives deep below the ocean's surface where meals are hard to come by. The fish can eat prey up to ten times its own weight, extending its stomach like a balloon to contain these large meals. Excitement has surged recently as missions to study Mars have turned up signs of methane, a common byproduct of organic processes. (Organisms ranging from microscopic organisms to mammals produce methane.) But as scientists studying Mars are well aware, there are also nonorganic sources of methane, and Siddall cautioned against overinterpreting these findings. Moreover, just because a planet has environments where life could survive, that doesn't guarantee that life did arise. "We have a good sense of where life can arrive," Siddall said. "We don't have a good sense of how it will arise in the first place. And that's the Holy Grail, in some respects, of biology." As the search for potentially habitable planets in the universe accelerates, the study of life on Earth may serve as a basis for finding life elsewhere.